The American Muslim Advisory Council (AMAC), and their director Paul Galloway have preached their mission is to form bridges from their community to law enforcement and other government resources. 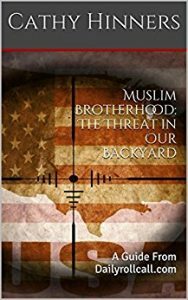 In 2011 Muslim activists joined together in a closed door meeting with officials from the TN Dept of Public Safety and Homeland Security, in an effort to combat legislation which they deemed to be “anti-Sharia”. This of course was untrue, as the bill that was proposed was an anti-terrorism material support bill. The result of this meeting was the creation of AMAC, whose director is Paul Galloway. AMAC has closely tied itself with law enforcement, particularly in Nashville TN, with Galloway always praising their relationship. From AMAC members attending Governor Haslams public safety summit to training with the Davidson County sheriffs dept, AMAC has inserted itself in the police world. Well, until the police enforce the law. The Immigration and Customs Enforcement (ICE) began conducting raids of homes with illegals this past week, netting at least 12 arrests, which has members of AMAC suddenly turning against law enforcement. On AMAC’s website those who fear they may be visited, or have been, are urged to fill out a form and visit the ACLU’s website for further information on what their rights are. Thomas Byrd, an ICE spokesman in the New Orleans office contacted by the Tennessean newspaper in Nashville TN stated that knocking on doors of people who are believed to be in the country illegally because they had been convicted of a crime or had removal orders issued by other countries is something agents do on a daily basis. Once again the keyword is illegal . AMAC, the supposed purveyor of patriotism and faith, and “building bridges”, lost any credibility they may have had by jumping on the protect illegals bandwagon..illegals that committed crimes. Not only has AMAC, and its director Paul Galloway, and board members lost credibility, it should be crystal clear their objective wasn’t to assist law enforcement, but to infiltrate them. Kurdish residents of Nashville that are here illegally and have committed crimes are being arrested and their organizations and community are angry. Angry because members of that community committed CRIMES and are here ILLEGALLY. Perhaps they should be angry with them for shedding a poor spotlight. But hey, all should be forgiven since Kurds cook food for Nashville. Seriously? ← Previous Previous post: Muslim Terrorists..Inspired or Directed? Great article! Metro has a huge problem with the Kurdish Pride gang as well.